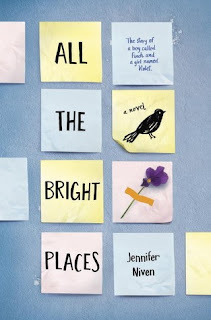 "The Fault in Our Stars meets Eleanor and Park in this exhilarating and heart-wrenching love story about a girl who learns to live from a boy who intends to die. There was not much going on in this book, honestly. Not much of a story, a minimal character development if there was any, really...the only good thing I can say about this book is that it was really well written and easy to read...and that's it. I did not hate the book, it was just meh...Suicide is a heavy subject and I was not left indifferent to the ending, but it was not enough for me to say "Oh my God, this is the best book ever!!! So many feels!!!". I heard so much about this book too! I'm in the middle of reading it, and I kinda feel meh. It's definitely a book that would appeal to John Green fans, with the characters being proud of their individuality and all, but for me so far, I'm eh. I only started reading it because I heard it dealt with mental issues well? Still reading but hopefully I'll get to something good! I love reading about the Tudor age, but yeah having stuff in HUGE depth can be a bit distracting at times :) Love the Taylor Swift gif!